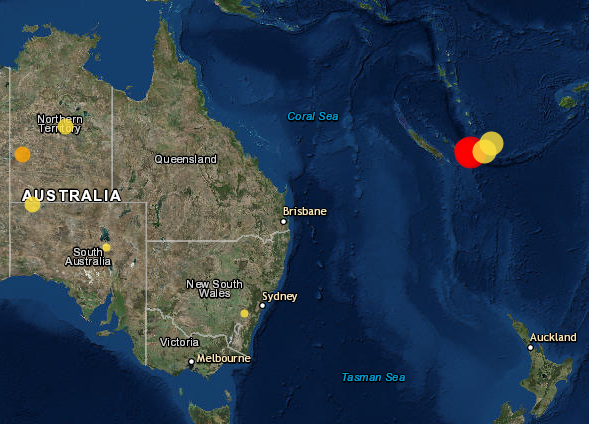 UPDATE at 4:50 PM | THERE is no tsunami threat to Australia following today’s earlier magnitude 7.6 earthquake off the east coast of New Caledonia, but authorities warn ‘hazardous waves’ are possible. 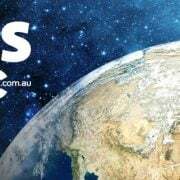 According to Geoscience Australia, the quake struck southeast of the Loyalty Islands about 3:18pm AEDT, just four minutes after a magnitude 5.7 quake hit the area. The Pacific Tsunami Warning Centre said the quake was shallow, striking at a depth of just 10km. A second magnitude 5.7 tremor was recorded at 3:30pm AEDT, 12 minutes after the large 7.6 event. The Pacific Tsunami Warning Center confirmed tsunami waves had been observed following the quake. It warned tsunami waves of between one and three metres above tide level were possible along some coasts of New Caledonia and Vanuatu, while waves under one metre were possible for Fiji. The PTWC said hazardous waves below 30cm were possible right across the Pacific, including in Australia, China, Columbia, Hawaii, Indonesia, Japan, Malaysia, Mexico, PNG and New Zealand. The Joint Australian Tsunami Warning Centre advises there is no tsunami threat to Australia.